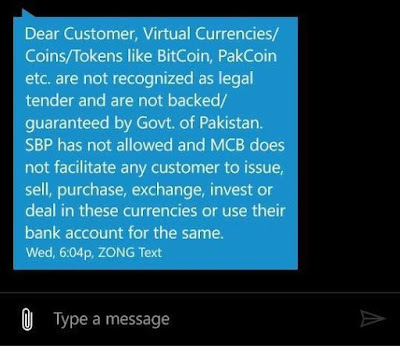 State Bank of Pakistan (SBP) has warned the general public against using cryptocurrencies/coins/tokens such as Bitcoin, Bitcoin Cash, Ethereum, Litecoin, Pakcoin, OneCoin, DasCoin, Monero, Pay Diamond, etc. on Friday. Any person found using cryptocurrencies/coins/tokens for the purpose of transferring money outside Pakistan will be subject to prosecution as per applicable laws. Salaam beautiful peoples! Yesterday I got a message from MCB Bank and started searching for it, and I reached a post of Mr. Waqar Zaka so I got an idea from that. Subscribe to our Newsletters for futures updates. State Bank of Pakistan (SBP) has warned the general public against using cryptocurrencies/coins/tokens such as Bitcoin, Bitcoin Cash, Ethereum, Litecoin, Pakcoin, OneCoin, DasCoin, Monero, Pay Diamond, etc. on Friday. 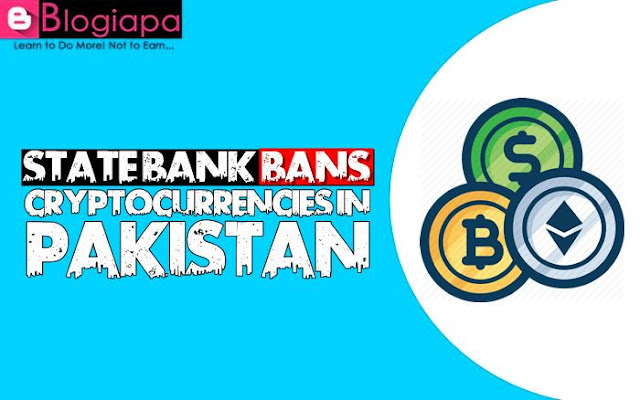 Any person found using cryptocurrencies/coins/tokens for the purpose of transferring money outside Pakistan will be subject to prosecution as per applicable laws. In response, Mr. Waqar Said: Get me an appointment with State Bank / IT minister to present reality of crypto, who is guiding them? Waqar Zaka is Founder of "Cryptoaya.com" Cryptoaya is a social media network and investment portfolio for the cryptocurrency world. Request to Cheif Justice Sahab, please check how State Bank is trying to save Low-cost investment schemes of banks and creating fear so ordinary Pakistani should not enjoy the biggest profits in human history that can actually change lifestyle from economy to business class. Estonia to Malta to Switzerland to Singapore to Belarus inviting the world to run their Crypto business. So Pakistani economist or authorities think they are smarter than above-mentioned countries? If some less informed person claim that Terrorist funding is easy through Crypto, please be sensible , why a terrorist will use internet or especially Blockchain to send money when it keeps an open record of everything and anything on Blockchain can easily be traced and if Terror attack funding was really a reason, after 9/11 do you think USA will allow crypto ATMs or CIA will allow crypto to operate ? The reason is that Pak Government is aware once crypto and specially Blockchain gets popular in Pakistan, records cannot be changes, from tax to value transfer to election voting, so they are trying to create fear regarding technology. For everyone, about this SMS, Let's clear this message which bank sent to you. "You cannot have a Company's bank account for running cryptocurrency business in Pakistan, State Bank is warning Banks that they should not allow bank accounts doing crypto business like Urdubit.com was doing and that's the reason it's no more"
if you buy crypto for a trader who is not registered then you might get into trouble as we don't know from where that trader got Crypto, maybe from someone who was involved in illegal activities as there is no 'Know Your Customer" KYC happening. Knowing this fact, I am running my business from Europe for a year now, Pakistani Authorities are forcing technology and investment leave Pakistan as many miners from Pakistan moved to other countries. Swap your coins online it is an easy process nowadays, because such useful service like https://swap.online allows you to exchange your BTC, USDT, EOS, ETH without involving any third-party. Atomic Swap is future of trading crypto.